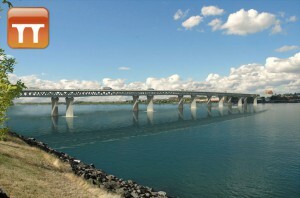 It would cost something to cross this proposed bridge, shown on the CRC website. Olson has learned, motorists will have three ways to pay the toll, now estimated at $2.50 but possibly higher during rush hour. They can use a transponder that causes the bridge to record their crossings; they can buy a pass for one or several days at a store, or they can be billed through the mail based on their license plates being read as they cross. What enforcement? They could be charged with “theft of services” under an existing law. This would be a misdemeanor until the amount of evaded tolls hits $1,000; then it becomes a felony. Or the state could hold up renewal of vehicle registrations, place a lien on property or garnish wages. Eighteen other states use one or several of these methods to collect tolls. Washington residents are expected to make up about two-thirds of the bridge users, Oregonians about one-third, and motorists from elsewhere about 1 percent. Now it’s obvious to me why officials were so concerned about the question of whether Oregon can enforce its toll-collection methods in Washington state. This sounds similar to how tolls are handled for the Golden Gate Bridge, including the cameras and mailing of toll fees to registered car owners. As I recall, Washington did not want to pony up money for this bridge last year, even though Oregon and the Federal government did. If that is still the case, and Oregon taxpayers foot a portion of the bill, then it would seem fair that cars registered in Oregon should pay less in fees than cars registered in Washington (or any other state for that matter). If that is not the case, then we would effectively be paying for the bridge twice.